Watch this 1 minute video to see how The Countess Group and Constant Contact can help your business grow. Click this special link to start using Constant Contact for your email marketing today, free. ​With month-to-month subscriptions starting at only $20/month – and no contracts – there’s no better way to start growing your business. Plus, we provide free training to help you get started. Email marketing consistently delivers one of the highest ROIs (returns on investment) of any marketing tool, measured at over 38:1 by the DMA (Data and Marketing Association). if you spend $1 on your email campaign, you should expect a return of $38. spend $100 and you should expect $3,800 back. spend $1,000 and you should expect $38,000 back. No other marketing tool we know of can deliver that kind of ROI. What else about email marketing? Fact: Sending an email that gets results is easy.​ It can take as little as 15 minutes to create an effective email. Fact: Statistics show that the average person only spends 15 seconds reading an email, so you shouldn’t take much time to create one. Fact: The purpose of an email campaign is to stay “on the radar screen” of the recipient and build a relationship. Fact: Today’s email marketing service providers help you do that far more easily than in the past. 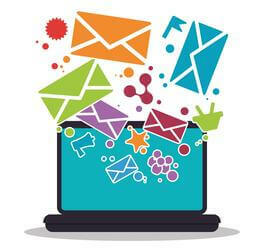 Contact us if you want to learn more about how email marketing can help you grow your business. Click here to get started with a 60-day free trial of Constant Contact. No credit card required. We provide free training.